Last week, Tom headed up to Kalgoorlie for the Goldfields Environmental Management Group (GEMG, http://www.gemg.org.au/) conference, and Andrew and I went to the Western Australia Surveying and Spatial Information Conference (WASSIC, http://www.wassic.org.au/) in Fremantle. GEMG is a conference held every couple of years, and includes mine site environmental staff and other professionals, including the regulators. It’s been a well-attended conference in the past and we have been before as an attendee, but this year we went as a speaker – and were not surprised to find it just as well attended this year! Tom gave a presentation about data management to the attendees, and looked at the deluge of data that they face. In Tom’s presentation, he worked through some of the steps you can take to create appropriate solutions, such as defining your questions, looking at the data required to answer them, and then the processes and eventually technology required to help manage address these questions more efficiently and effectively. Tom’s slides are below. What was also very impressive from the GEMG is that Tom passed around a few stubbie holders during his talk to ask people to donate money to the Cancer Council Morning tea that we held this morning. 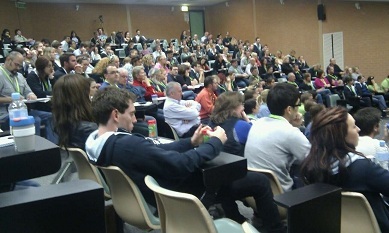 GEMG attendees donated over $780 to the cause (which we will be matching when we finalise the donations by Friday)! So a big thanks to all the GEMG attendees for their charity! WASSIC was almost entirely oriented to the surveying industry this year, so it was a hard decision to send anyone along, to be honest. In the end, I attended both days due to my commitments there, and Andrew came down for the Friday. It’s worth noting that we left early on both days, and that we’d really struggle to justify attendance next year if the same style of program continues. Anyway, on Day One in my role as a member of the Regional Management Group (RMG), I was helping to organise a Spatial Industries Business Association (SIBA, http://www.spatialbusiness.org/) meeting during lunch. While it wasn’t particularly well attended, it did give us some time to talk about education across the spatial industry, and to get some time to talk through a few miscommunications between attendees over time. I hope this goes some way towards opening a few more doors for collaboration for SIBA and the industry – that’s why I joined the RMG. In my presentation, I looked at where innovation comes from and has been involved throughout the history of our industry (looking at maps, surveying, IT hardware, spatial analysis and even SSSI), then looked at what innovation can do to industries (I pulled out my old typing pool/word processing/IT industry comparison), and then gave some pointers about where to look for innovation and how to look for it, citing our own efforts on the weekly review and sprint days. My slides are below. 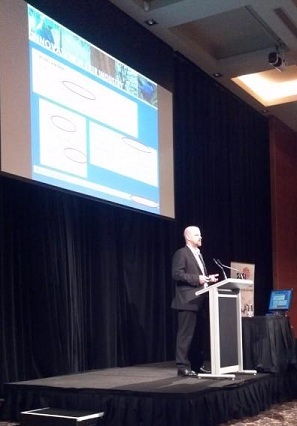 It’s been a particularly busy week for presentations for me, with the presentations to Curtin and UWA students last week (https://www.gaiaresources.com.au/website/gaiaresources/newsarticle/669/) so I’m looking forward to getting out of the spotlight for a little while… but a question for you – what’s the best innovation you’ve seen in the spatial industry? Please leave us a comment below. If you want to follow up on our presentations, please drop either Tom (email – Twitter), Andrew (email – Twitter) or myself (email – Twitter) a note.